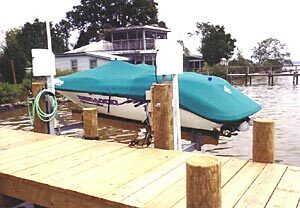 Our low profile personal watercraft (PWC) boatlifts come in two weight capacities, the ECBL-1500, which is a single piling application and the ECBL-2500 model which is a two piling lift. 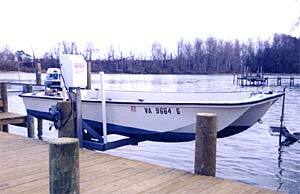 All boatlift motors are available in manual or electric. PWC lifts are great for jet skis, Jon boats, jet boats or other small personal watercrafts. Also available with 1,500 lb rotational units. 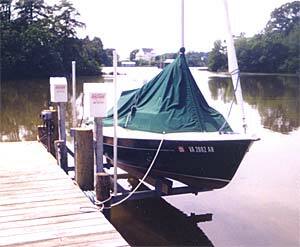 These low profile pwc boatlifts are designed to lift the watercraft beside the dock and not interfere with the use of the dock space. The track provided for travel is designed to extend the length of piling for total support. The tracks are available in either stainless steel or hot dipped galvanized steel. The cradle acts as a forklift to raise and lower a Jet Ski or other small personal watercraft (PWC). 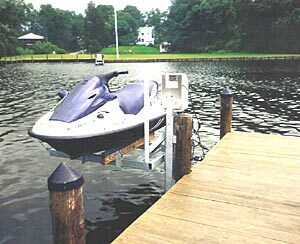 A rotational unit that allows the jet-ski or boat to be rotated on to or over the dock can be fitted as an optional extra. For details contact us. 8', 10', 12' stainless or hot dropped galvanized steel.